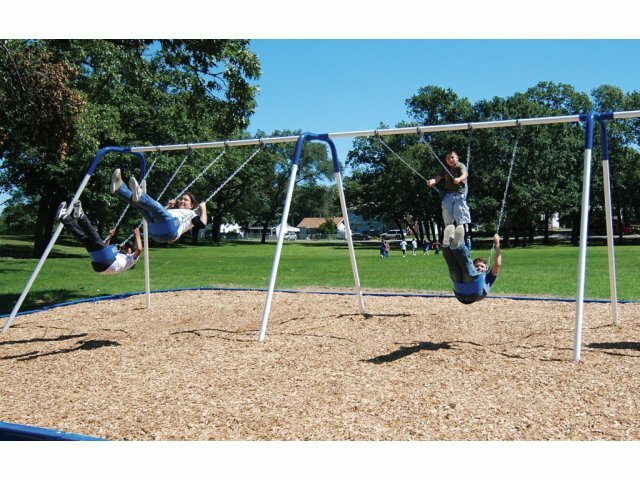 Let your students enjoy weightlessness as they slowly fly higher and higher on playground swings. Nothing can replace the relaxing feeling of wind blowing through your hair as you soar through the air on a playground swing set. Swings don’t just feel great, they also help develop important life skills including coordination, sensory integration, perceptual skills, spatial awareness and more. Playground swings are a popular choice among kids of all ages. Making sure that yours are sturdy is key if you want students to get maximum use and enjoyment from them. Bipod playground swing sets can accommodate up to four swings. Belt seats and stainless steel hardware look and operate exceptionally well for the long term. 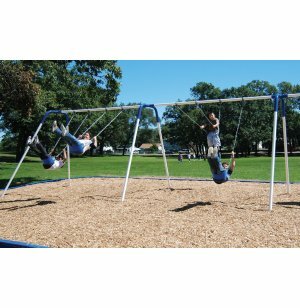 If you are having trouble deciding which playground equipment will be most enjoyable for your students, go with a classic they are sure to love and try some sturdy swings from Kidstuff Playsystems. Skills Development: Swinging promotes coordination, sensory integration, movement, perceptual skills, spatial awareness and many more important life skills. Sturdy Design: Belt seats and stainless steel hardware can bear the elements for the long term. Capacity: Accommodates up to four swings.